We have called for enforced speed-limits on unfenced roads across common land in national parks and areas of outstanding natural beauty. We made this plea in our evidence to the government’s review of England’s national parks and areas of outstanding natural beauty (AONBs), led by Julian Glover. The society emphasises the need to slow traffic across commons so that they can be grazed by stock, in the interests of the public who have a right to enjoy these attractive areas on foot and often on horseback, and the farmers for whom livestock grazing is fundamental to their livelihoods. The society explains that common land is of immense importance to the national parks and AONBs,(1) because of its significant public benefit, for its natural history and wildlife habitats, landscape beauty, cultural, archaeological and historic heritage, and public access by right. Says Kate Ashbrook, our general secretary: ‘The vegetation of common land needs to be managed to ensure that the land can be enjoyed by walkers and riders, and historic features are visible. An important means of doing this is by grazing livestock. However, where commons are crossed by roads with speeding traffic commoners are naturally unwilling to risk their animals, for fear of injury to stock or human. ‘We oppose the fencing of roads across commons because this restricts public access and is a blot on the landscape. We consider it is much better to slow the traffic. This would also encourage motorists to appreciate that national parks and AONB are special places which are not to be rushed through. But such speed limits must be enforced or they will be ignored. ‘National park authorities and AONB boards and committees should be given the power to impose speed limits on unfenced roads across commons, as though they were the traffic authorities. The limit should be as low as 20 mph in some places. We would like to see sympathetically-engineered traffic-calming measures introduced as well. Warning notice made by local resident near Crapstone in the Dartmoor National Park after eight sheep and three ponies were killed in 10 days on the road here. Photo: DLPS. ‘There are already speed limits on some commons, on Dartmoor and in the New Forest for instance, but they are too often ignored and need greater enforcement. We would argue for speed limits wherever there is an unfenced road across common land—in the North Pennines, Bodmin Moor, the Malvern Hills and Gower AONBs and the North York Moors and Brecon Beacons national parks, to name a few examples. It would be a great idea to pilot this idea in the national parks and AONBs. 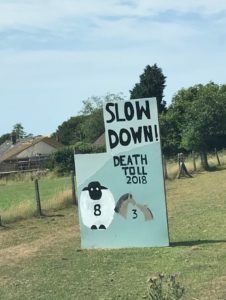 ‘On Dartmoor, even where there is a 40-mph speed limit on many roads across the commons, the Dartmoor Livestock Protection Society reports that in 2018 there were a shocking 191 accidents involving livestock, with 158 animals killed and 33 injured(2). The excellent DLPS urges people to drive with care for animals, but clearly the speed limit has to be enforced in order to slow the traffic. ‘We hope that the Glover Review will adopt our proposal as this would give it considerable weight. In this seventieth-anniversary year of national parks and AONBs, our initiative would be a great way to celebrate those precious landscapes which were created by the National Parks and Access to the Countryside Act 1949,’ Kate concludes. In England, Natural England has calculated that 48 per cent of commons by area (10 per cent by number) are in the national parks, and 31 per cent by area (23 per cent by number) are in the AONBs. Of the 158 animals killed in road traffic accidents on Dartmoor in 2018, 32 were ponies, 117 were sheep and nine were cows (source: DLPS).